Fred Olsen has gone back to their previous 1930's style and recently repainted their fleet of four white hulled cruise ships in a dark grey colour..
Picture shows the largest ship in the Norwegian family owned fleet , the 43,537 grt. ' Balmoral ', which carries 1,350 passengers with a crew of 510, in her smart new colours. This company started in 1848 and is run by the fifth generation of this Norwegian family from offices in the UK. They mainly operate cruises from port around the UK, with some winter time fly cruise options, and will also operate a round the world winter cruise from the UK port of Southampton , which sails on 8th January 2017, and takes 115 nights with two day stays at several ports to allow more time ashore ! Fares started from £9,999.00p, which is about £ 87.00 per day, and the cruise sails out via the ' Panama Canal ' and returns via the ' Suez Canal ' ! This cruise is on the classic 28,613 grt ' Black Watch ' which carries about 800 passengers, with a crew of 330, and when built was one of the ' Royal Viking Line ' deluxe cruise ships which operated world cruises and were also Norwegian owned. 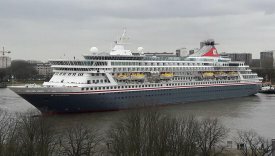 Picture shows the ' Fred Olsen Cruises ' classic cruise ship ' Boudicca ' during a recent visit to the UK port of Liverpool from where she operate some cruises . She is also in the companies latest colour scheme.